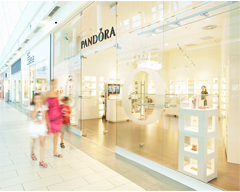 You can buy PANDORA jewelry in your local PANDORA shops. We do not currently sell online. 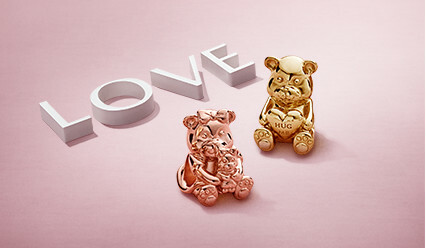 PANDORA rings are crafted from lustrous precious metals – 14ct yellow gold, sterling silver and PANDORA Rose. The hand-finished ring designs feature a variety of classic and modern stone settings and unique embellishments. Inspired by vintage treasures, geometric forms and nature’s most enduring motifs, rings are finished with feminine details such as cut-out hearts and milgrain beading. Each ring passes though an average of 30 pairs of highly skilled hands during the crafting process, ensuring every piece is truly unique. 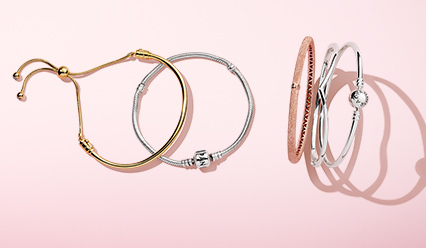 Stack slender bands to create your signature look, or wear your chosen design solo for maximum impact. Stunning simplicity, quality craftsmanship and timeless designs make up PANDORA’s versatile range of band rings. Crafted from lustrous metals – cool sterling silver, warm 14ct gold and blush-pink PANDORA Rose – our designs are punctuated with glittering cubic zirconia, faceted crystals, colourful enamel and freshwater pearls. Designed for effortless layering, our gold rings are embellished with glittering stones or decorated with openwork details that lend charm to each design. Statement ring styles are adorned with striking crystals, faceted to showcase their beauty, or embellished with a multitude of glittering stone cuts. And timeless motifs such as bows and flowers decorate lustrous gold rings that work beautifully for day or night. Put a luxurious spin on your jewellery collection with PANDORA’s beautifully crafted rings, hand-finished from solid 14ct gold. Sourced from reputable refining companies certified according to the RJC Code of Practices, PANDORA’s 14ct gold is guaranteed conflict-free. 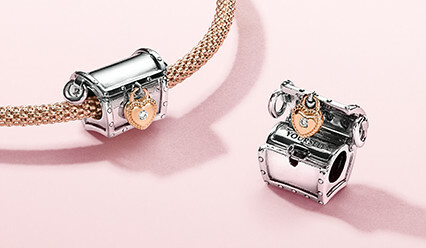 Hand-finished to perfection from high-quality metal, PANDORA Shine is a beautiful new gold-plated jewellery collection. Consisting of a durable sterling silver core, a layer of highly resistant palladium and an outer layer of luxurious 18k gold plating, PANDORA Shine is crafted to meet PANDORA's exacting craftsmanship standards. Its rich golden hue brings elegance to ring stylings, from bold ring stacks to minimalist looks. 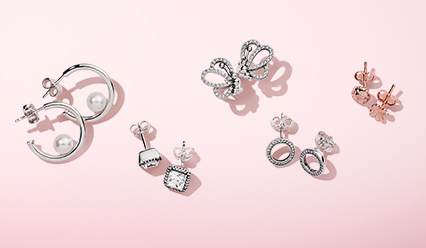 Adopt the look today and mix and match the PANDORA Shine rings with earrings, necklaces, charms and bracelets. Exude elegance with stunning rings in PANDORA Shine, a radiant new 18k gold-plated sterling silver. Shimmering cubic zirconia and colourful crystals create high shine looks for every occasion, and hand-applied enamel lends pops of vibrant colour to floral motifs and sleek band rings. Mix stackable ring styles in sterling silver with 14ct gold or PANDORA Rose rings to create a contemporary mixed look, or opt for a single statement ring to showcase its beauty. 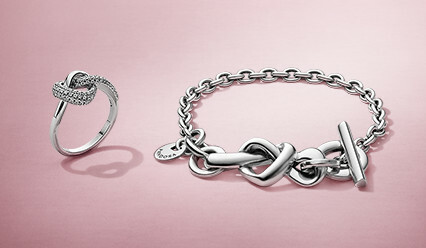 Make a sterling impression with PANDORA’s versatile range of silver rings for women. Hand-crafted from ethically sourced sterling silver, beautiful and feminine designs are adorned with intricate details such as cut-out hearts and milgrain beading. Stand out in style with a single statement ring, intricately embellished with glittering stones, or stack them up for a unique look, mixing feminine motifs and colourful crystals. 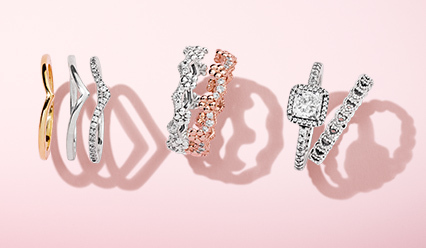 PANDORA’s hand-finished ring designs feature a variety of stone settings and unique embellishments so you can create an endless array of looks to suit your style. Express your individuality with PANDORA’s statement rings. Crafted from precious metals such as sterling silver and 14ct gold, our versatile range of statement jewellery is perfect for dressing up everyday outfits or adding a statement to after dark looks. From colourful gemstones and brilliant diamonds to freshwater cultured pearls and man-made stones, high-quality materials lend feminine shine and colour to each unique ring design. 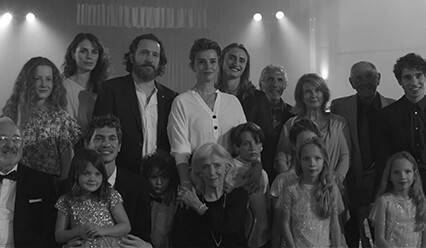 Stones are individually set by hand by PANDORA’s skilled stone setters, using high-end craftsmanship techniques to create beautiful hand-finished designs. Create colourful combinations with birthstone rings, or wear a single ring with glittering clear cubic zirconia stones or shimmering pearls for a more refined look. Whatever the occasion, PANDORA’s stone-studded rings lend shine and beauty to everyday looks. 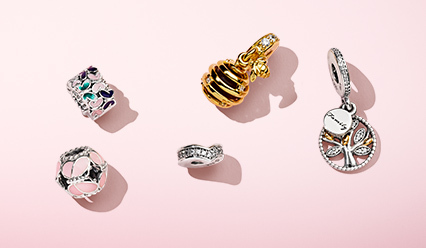 PANDORA’s pretty stone-embellished rings lend a touch of femininity to every look. Crafted from sterling silver, 14ct gold and PANDORA Rose metals, each striking design is set with ethically sourced stones. Inspired by nature, geometric shapes and timeless treasures, stylish ring designs are set by hand with shimmering stones, colourful enamel and captivating crystals. And are detailed with cut-out hearts and milgrain beading. From stunning statement rings to stackable band styles and simple, feminine designs for day and night, create your signature look with our versatile range of rings.